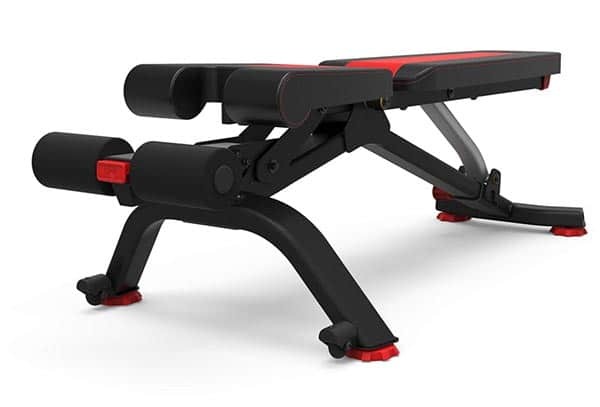 Since I’ve tested a lot of folding benches, but written only one other review so far, I’ve decided to take a closer look at the Bowflex 5.1S Stowable Bench to see what this beauty is capable of. Bowflex brand is well known in the fitness equipment industry. 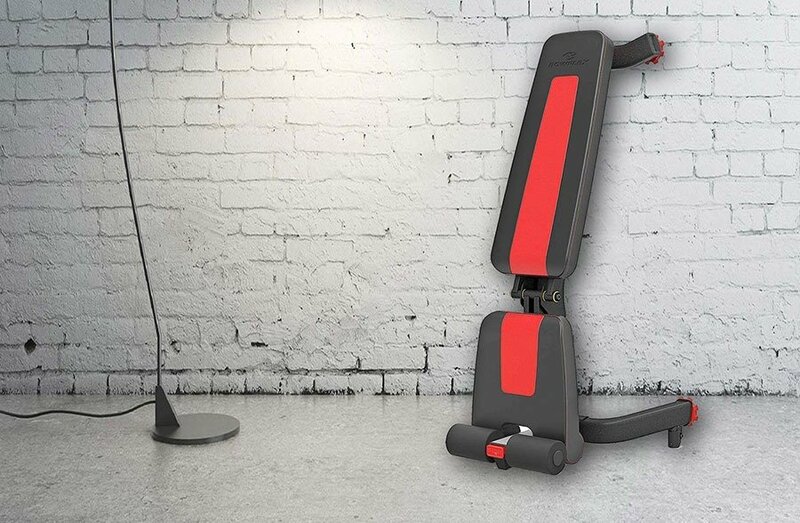 They make everything from adjustable dumbbells to stow-able benches to complete home gyms. Recently, they have released a new bench, the 5.1S, which does not have many reviews only yet, so let’s get right to it. Not many folding & stow-able benches offer this kind of Decline and Incline degree positions, so that’s definitely something to check out. Usually you can see up to 10-degree decline position, if any. Bowlex 5.1S definitely stands up here. The bench came in one package and everything was tightly packed. Once I’ve opened the box, the bench seemed relatively put together already. Allen keys were included in the box and the total assembly took me about 25 minutes – on my own, without any help. The assembled dimensions are 56″ L x 26″ W x 20″ H (142.25 L x 66 W x 51 H cm). Even if you are a smaller person, you should not get into any trouble trying putting it together on your own. Hold Tight, 150 lbs Coming! First, I’ve tried the flat position for some bench-pressing. The Bowflex 5.1S Stowable Bench was rock-solid and comfortable on the back, so nothing to worry about here. If you want to use incline or decline positions, then you have to use the pull-out pin. This pin allows the upright support arm to move smoothly up and down the floor leg. So, if you are satisfied with the selected position, simply pop the pin into the place and you have the back-pad tightly secured. The seat part has also two positions available, the flat one and raised one. The raised position is comfortable enough and also it’s high enough to prevent sliding down the seat. When the seat is raised and the backrest are lowered to the max, they are at the same angle, which is great for decline exercises like sit-ups and crunches. If you want to change the seat’s position, the raised position locks on its own and to get it back to the flat position, you need to use the small red lever next to it. With that being said, the gap between seat and back-pad is quite large in the flat position, so smaller people, like me (5’10 – 150 lbs) might feel uncomfortable. If you are even smaller, the gap might put way too much pressure to your back. Something to look out for. The ankle holders are covered by foam, which is not really that comfy, but I guess it does not have to be made of plush bears. The legs of the bench are adjustable, which is a good addition for those who do not have even floor. 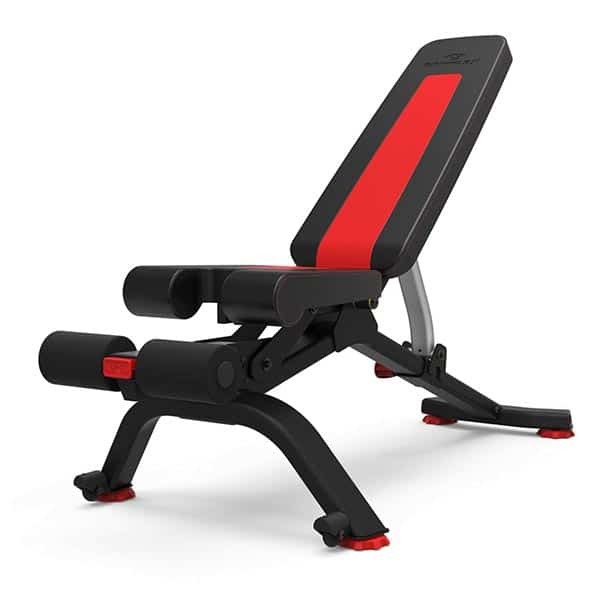 The Bowflex 5.1S Stowable Bench is one of the best out there. It is one sturdy, comfortable bench for all kinds of people. With that being said, if you are a smaller person, the gap between the seat and the back-pad might be too large and uncomfortable. Overall, definitely a bench worth checking out.